The Regent in Christchurch is The One! 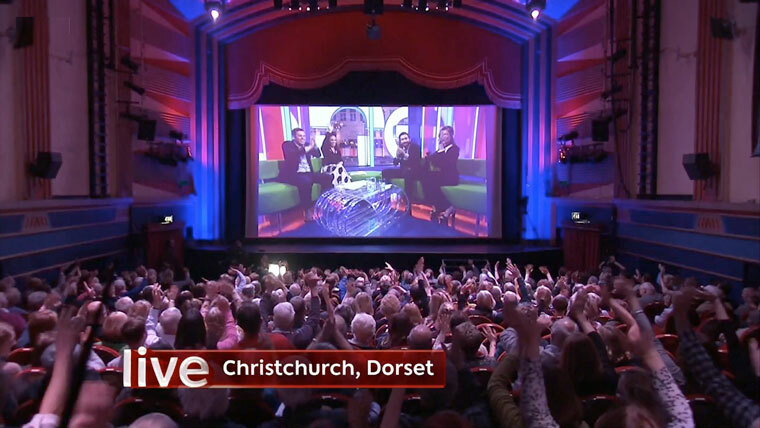 There was only one place to be in Christchurch on 15 March at 7pm and that was at the Regent Centre, which was chosen from all the independent cinemas in the UK, to provide a representative audience of film fans to appear live on BBC 1’s The One Show. A near capacity audience of 476 (full house is 484), who had booked to see the Oscar nominated film, Lion (PG), at the Regent Centre on 15 March, were amazed to find themselves as the stars of the evening, live on The One Show. The lead story on The One Show was an interview with Hollywood A listers, Jake Gyllenhaal and Rebecca Ferguson, who were promoting their brand new film, the Sci-Fi thriller, Life (15), produced by Sony Pictures and due for release in the UK on 24 March. What the Regent audience did not realise was that the BBC also had a film crew in the Christchurch auditorium, ready to beam back their live reaction by satellite to the star interview and the clips from Life (15). Life (15) obviously met with the film fans’ approval because there was loud applause and cheers as their reactions were beamed across the UK on BBC 1. The scheduled showing of Lion (PG) followed at 8pm just to complete an unforgettable night out for the audience at the Regent. Christchurch will get an early chance to see Life (15) when it will be shown at the Regent on 5 April at 5.15pm and 8pm.